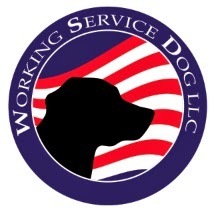 We thought we would post some answers to typical questions we receive here at Working Service Dog. When you meet a person with a service animal, please remember that the service dog is working. Don’t do anything to interrupt the service dog while it is performing its tasks. 1. Speak to the person first. Do not aim distracting or rude noises at the animal. 3. Do not offer food to the service animal. 4. Do not ask personal questions about the handler’s disability or otherwise intrude on his or her privacy. 5. Don’t be offended if the handler does not wish to chat about the service animal. As defined by the Americans with Disabilities Act (ADA), a service dog (or miniature horse) is one that performs a task for the benefit of a person with a disability. It is any physical or mental condition that substantially limits a major life activity. Some disabilities are not visible, such as deafness, epilepsy, diabetes, and psychological conditions. 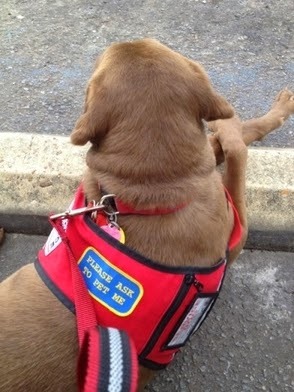 What are some tasks that service dogs can perform for someone with a disability? What special laws apply to service dogs? The ADA requires businesses and places of public accommodation to admit people with disabilities who have service animals to their premises. People with service animals have access to nearly every place where the general public is welcomed. The only exceptions are, for example, kitchens of restaurants (food preparation) and sterile areas of hospitals. The Fair Housing Act permits a disabled person to keep an assistance animal (most species) and waive the usual pet policies of the housing complex. Landlords are permitted to require verification that the pet is “necessary for the tenant’s health and well-being.” *Note: with this law and the one that follows, the animal is not required to perform a task. The Air Carrier Access Act allows people with medical or psychological conditions to have their assistance animal ride in the cabin of an airplane. Airlines are allowed to ask for verification that the animal is necessary for the health and well-being of the passenger. How can I be sure a is a service dog and not just a pet? If a person wants to bring their dog into a public place, the only questions allowable are, “Is that a service animal?” and, “What task does s/he perform?” Asking about the person’s disability or requiring to watch the animal perform the task are in violation of the person’s rights. Does the animal have to wear a vest to identify it as a service dog? No, there is no federal requirement for the dog to wear any special gear or identification. There is also no requirement that the handler carry any certification papers show­ing that the animal has been trained for service. Some service animals may have certification from a professional trainer, but many are trained by their handler. What if my employees don’t like animals or are allergic to them? If you operate a business open to the public, you must permit a person with a service dog to have access. Reasonable accommodation must be given to the disabled person. For example, if a service dog must enter a business at the same time as a person who is allergic to dog dander, they should be assigned to different locations within the building. What if the service dog barks, growls, or whines? First, find out what happened before taking action. Perhaps someone stepped on the dog’s tail, causing it to yelp. It is also possible that the dog is responding to the handler’s medical condition.If the service dog’s behavior is not controlled quickly by the owner, you may ask the handler to remove it from the premises. The handler is responsible for any damage done by his or her service dog . What if other customers complain about a service animal being present? Explain to your customers that the service animal is medically necessary and that federal law permits people with service animals to have access to public places. Check with the Attorney General’s Office in your state for applicable state laws and regulations. *If federal and state laws conflict, the one that affords the greatest protection to the person with a disability takes precedence.